✓ What is the normal order of use for the 6 InfiniSync programs? Generally speaking, we recommend using the InfiniSync programs in the following order- Guided Meditations->NeuroAscent->NeuroPeak->NeuroNova->Awakened Mind->RefinedMind. However, with varying personal preferences and levels of user experience, this is not set in stone (i.e. some people prefer tracks without a spoken voice so they start with NeuroAscent, some people have practiced for years and wish to begin with NeuroPeak, etc). You can try the various programs out yourself and focus on those you find most useful. ✓ How much time per day should I spend using InfiniSync? We recommend sessions of 20-24 minutes per day, which is roughly 1 InfiniSync track. We have found this to be the optimal amount of time for maximum benefit. Many users say they see greater benefits from using the technology twice per day, so you are welcome to try that if you prefer a quicker result. We don’t recommend going over this, however. 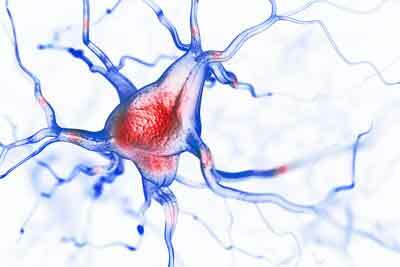 Just as it is possible to overdo exercise for the body, it’s possible to overdo exercise for the brain/mind. 1-2 tracks per day is more than enough usage to see amazing results. 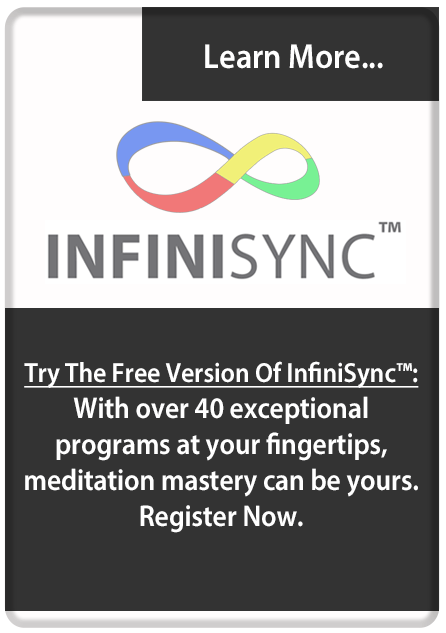 ✓ What should I expect each InfiniSync meditation session to be like? It usually takes 10 minutes (sometimes more for beginners) to reach a state of meditation, while learning true mindfulness in and out of the meditative state is a bit of a longer process. The more times a person uses the technology, the shorter the amount of time it takes to achieve this highly beneficial mind-state. ✓ The InfiniSync experience is so pleasurable. Can you tell me more about the audio layers I am hearing? ✓ What is the thought process behind the InfiniSync collection of programs? 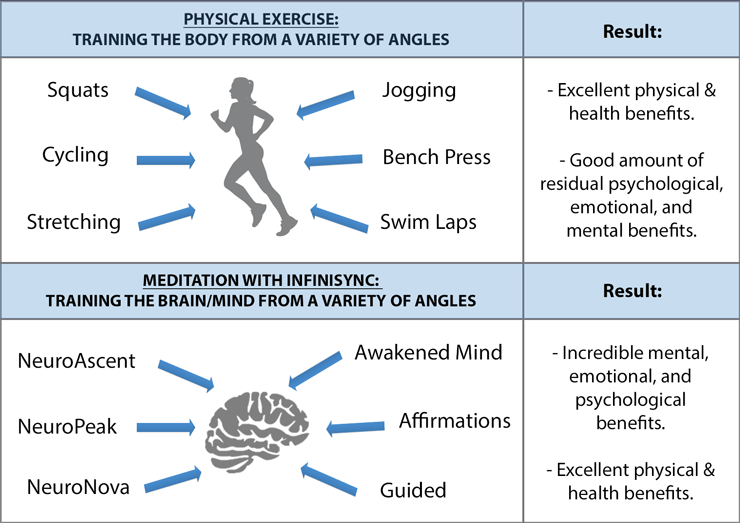 Just as as an olympic athlete would incorporate a variety of protocols into his/her training regimen to increase the speed/endurance/strength of their body, InfiniSync is a mental/emotional/cognitive toolkit designed to bring excellence to your brain/mind, from a variety of angles. In fact, meditation is gaining huge popularity among professional athletes, with many at the top of their sport declaring their success is in great part owed to the age old mind practice. Of course, you don’t need to be an elite athlete to experience the limitless benefits of meditation. There are countless people all over the world just like you who have had their lives transformed from the inside out. 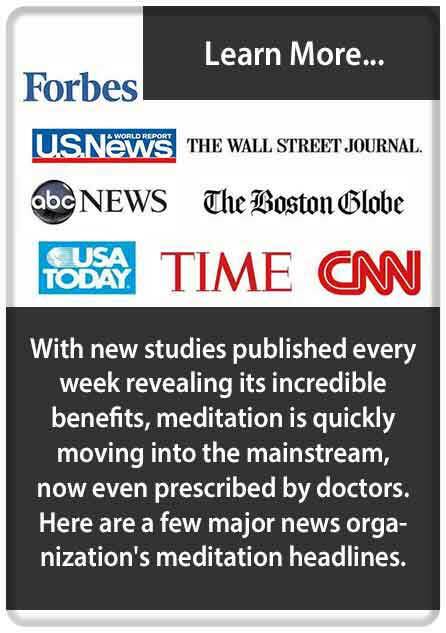 We are truly living in the “revolution of the mind” era, with new studies being posted every few days discovering some “new” benefit of meditation. 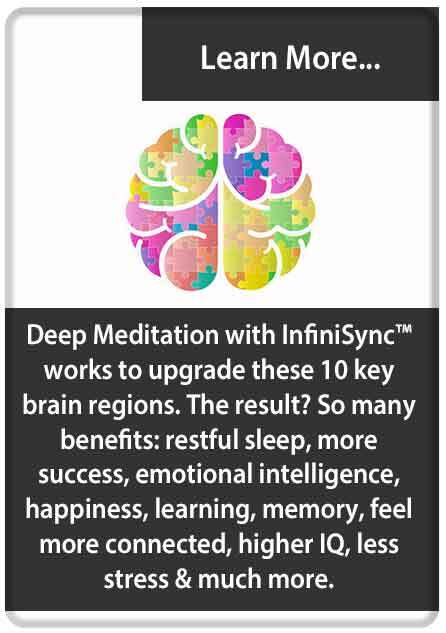 We invite you to experience these limitless benefits with InfiniSync! 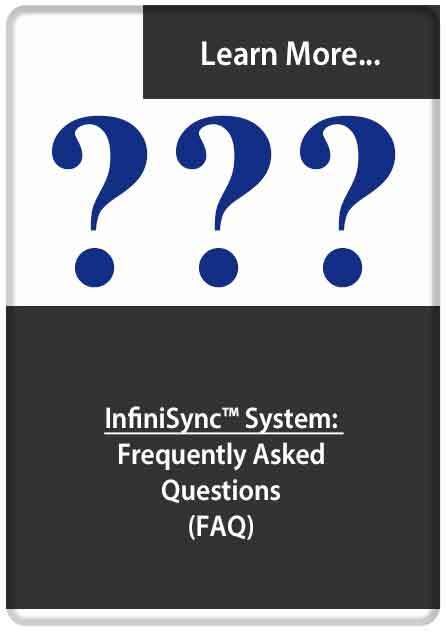 ✓ What are the differences between the InfiniSync programs? What is your strength level grading system? The differences between the programs are mostly in the design complexity, the degree to which every proprietary InfiniSync brainwave entrainment feature has been implemented. 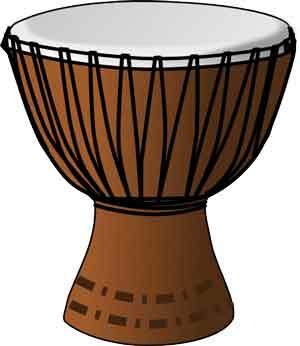 In other words, during entrainment, certain variables can be turned up and down to tune the session toward a user’s level of experience. For the stronger entrainment sessions, a certain amount of experience and training is necessary for the user to be able to handle the incoming frequencies/features. 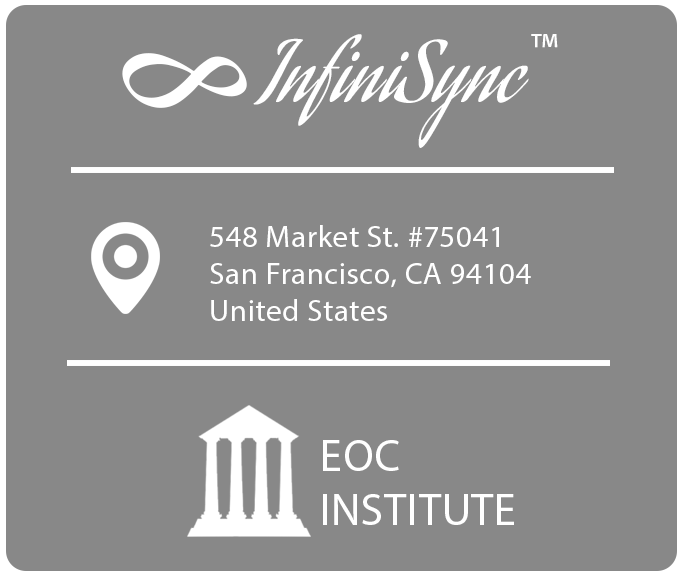 We have precisely designed InfiniSync with this in mind, ensuring you advance in the most effective and efficient manner possible. ✓ What are the differences between the InfiniSync levels? 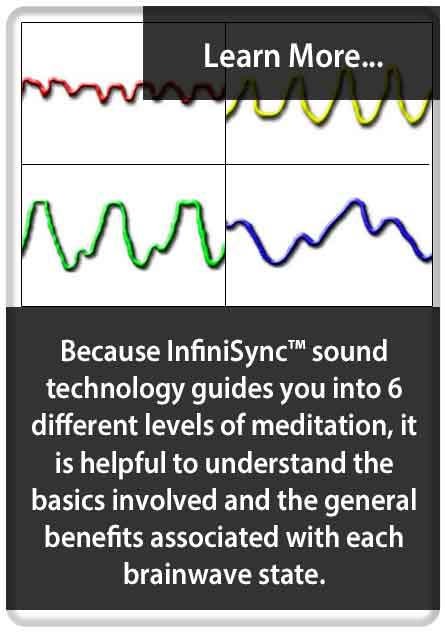 All InfiniSync levels bring you the brainwaves of meditation: Alpha, Theta, and Delta, in progression. 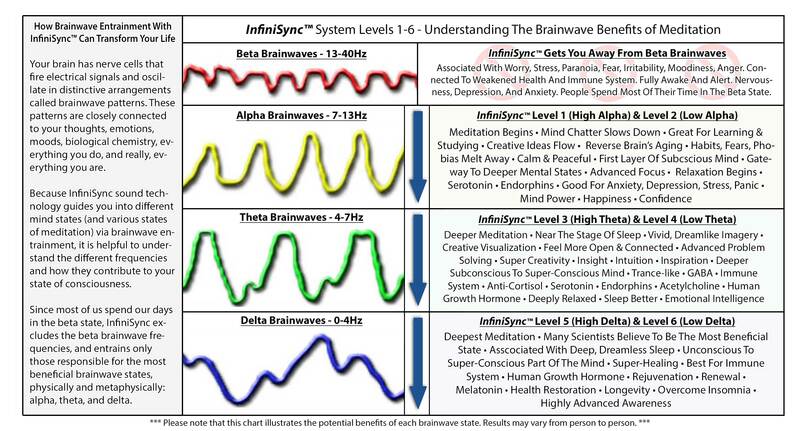 Levels 1 & 2 are HI/LOW Alpha, Levels 3 & 4 are HI/LOW Theta, and Levels 5 & 6 are HI/LOW Delta, respectively. 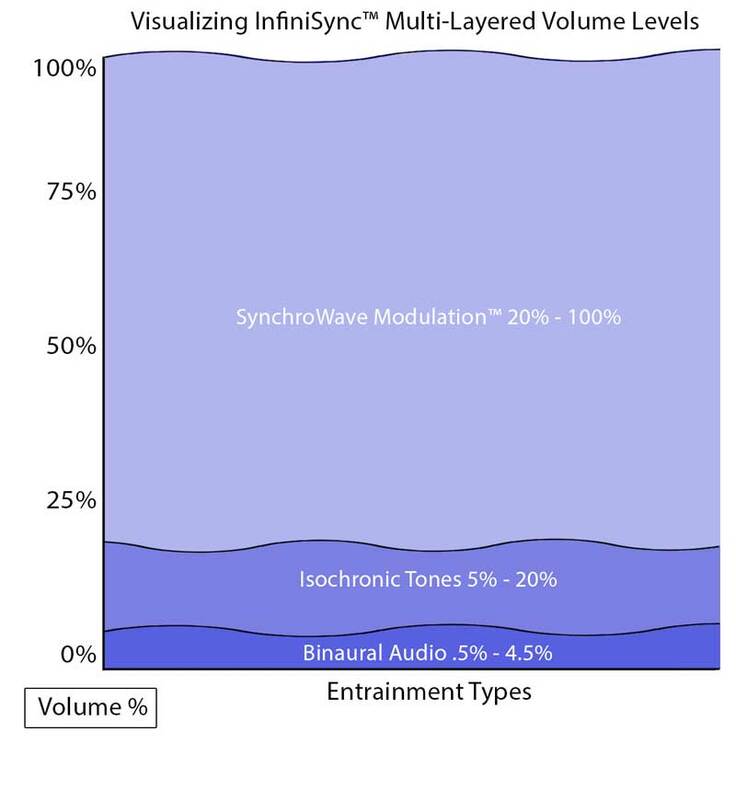 More specifically, the differences between the brainwave entrainment frequency focus of each InfiniSync program can be found on this benefit chart. 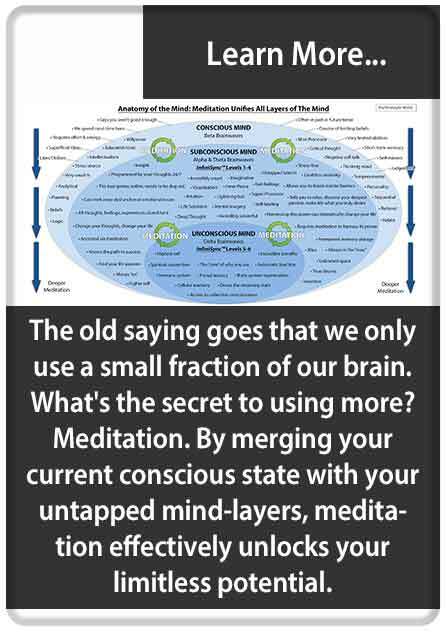 The one exception to this rule is the Awakened Mind program, which targets a combination of all brainwave frequencies. You can read more about this program in its respective tab location. ✓ I have completed through level 6. What tracks should I use going forward? It should be clear at some point during your training with InfiniSync that certain programs/levels are more aligned with your taste/positive experiences, resonating with you on a deeper level. For example, if you find that you really like NeuroPeak Level 2 then that is where you should focus your efforts and sessions (and it’s ok to keep using the same track/tracks if they really work for you). The greatest benefit will come from consistent use, regardless of your preferred program/level. It is important to note that some people respond better to more simple programs, some people like complex, some people like both equally, etc. It is all up to you, there are enough tracks to provide fresh meditative benefits for decades. 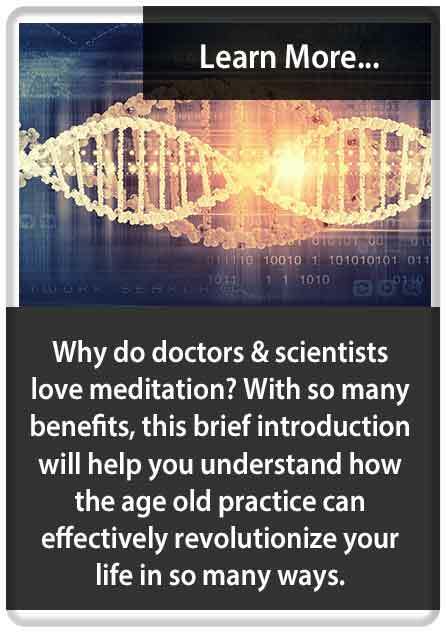 ✓ The science behind meditation and brainwave technology is amazing. Where can I learn more? 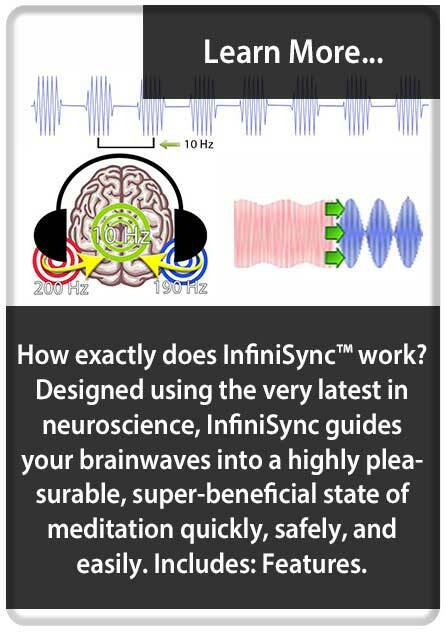 InfiniSync’s design is based on the 1000′s of studies conducted on the effectiveness of brainwave entrainment technology, and 10,000’s of studies confirming the powerful benefits of meditation. If you are interested in better understanding the power of this technology and rapidly expanding field of research, then you can find a very abbreviated bibliography here, a very small sample of the studies out there. ✓ When using InfiniSync I feel a wonderful heightened awareness, can you tell me more about that? There is an incredible array of new physical sensations, thoughts, and feelings one can experience during all levels of the meditation journey, especially for beginners. Much of this is based on user expectation combined with the natural increased level of awareness so easily created through meditation. It is important to know that what InfiniSync is causing you to experience is completely natural and normal, not so much different than what is experienced while sleeping, when many of the same brainwave patterns are present. The difference being is that your normally inaccessible subconscious mind and its heightened awareness is suddenly available to your conscious mind, which is a very profound and good thing. The result? You awaken to a whole new world. ✓ Will I always have to use InfiniSync to maintain the benefits achieved? 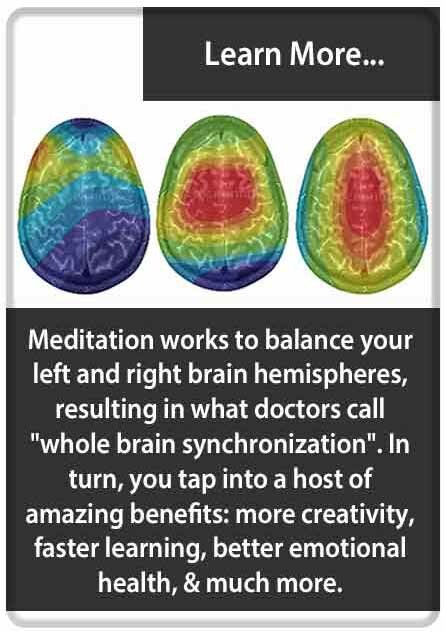 Just like physical exercise for the body, meditation via brainwave synchronization brings temporary benefits that last for a few hours, short term benefits that last all day, and long term benefits that last for a lifetime. If you get to a place where you are happy with your gains, you can simply move to a maintenance routine. 10-20 minutes per session, 2-4 times per week can help you maintain all of your meditative gains. 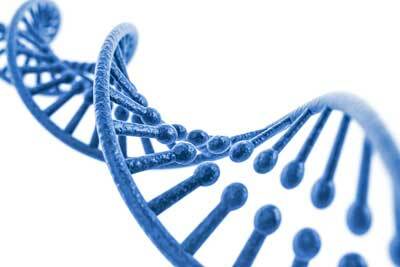 However, most people find InfiniSync so beneficial and pleasurable that they continue use indefinitely. ✓ What equipment do I need for your program? What kind of headphones do you recommend for InfiniSync? Though some aspects of the technology will work without them, InfiniSync is designed to be listened to through stereo headphones. Speakers are not recommended because each ear must perceive different tones for the for the full brainwave technology’s effect to work. Headphones that enclose most of both ears are recommended, and definitely do not need to be costly. An inexpensive and highly effective alternative are earbuds/earphones (the kind that fit inside the ear canal). 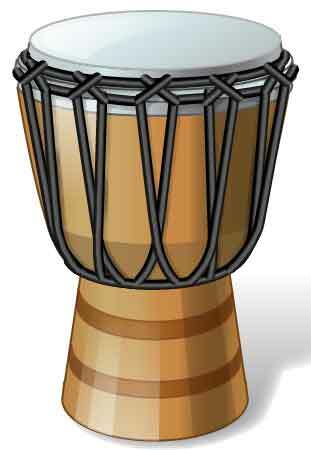 ✓ Can you tell me more about the Drumscape tracks? ✓ Does a spoken voice make a difference in regards to depth of brainwave entrainment? Having a spoken voice on a track does indeed affect the quality of brainwave entrainment. Generally speaking, the brainwaves will not get quite as deep nor be as stable when compared to a voiceless track. 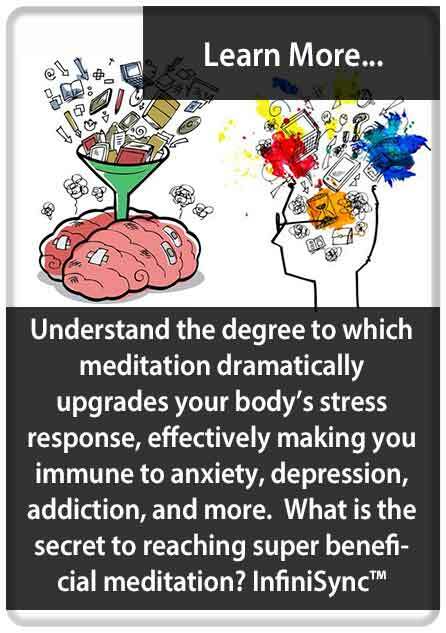 Because of this, the voiced programs (Guided Meditation and RefinedMind) do indeed have a reduced strength grade level. While the brainwaves may not get as deep, a well-directed voice can work wonders in teaching you how to meditate (Guided) or providing mind/life improving statements (RefinedMind). InfiniSync was forged with this delicate balance in mind. ✓ When should I move from the guided meditation programs to NeuroAscent/ NeruroPeak/ NeroNova/ etc.)? 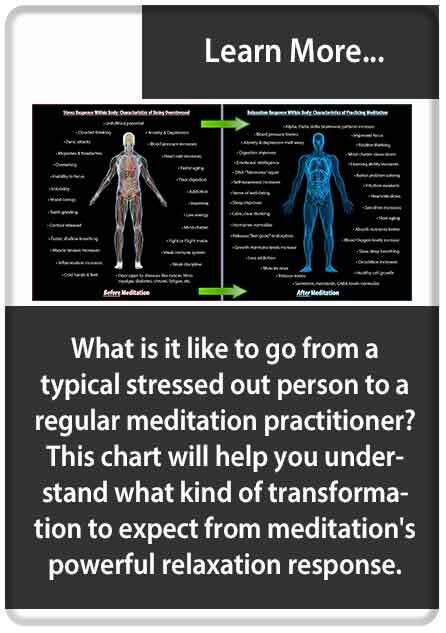 Each user will spend a different amount of time with the guided meditation programs. In fact, some users bypass them altogether and start with NeuroAscent (though that is rare). We recommend using each guided program at least a few times — if nothing other than to pick up some meditative pointers to bring to the stronger InfiniSync programs/tracks. Of course, we also have users who absolutely love the Guided tracks, spending a great deal of time there. We encourage you to follow your intuition and do what you find works best. As long as you use the technology regularly you will see great results, regardless of your chosen InfiniSync programs. Meditation is the highly-fertile mental environment where an incredible variety of inner and outer transformations take place. 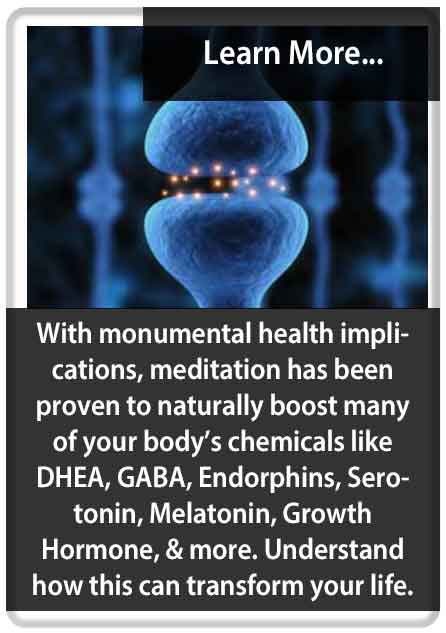 All of the benefits listed in the “RefinedMind” section are also common benefits and natural by-products of practicing meditation, as evidenced by countless scientific studies. So, is not entirely necessary to use the “Anxiety” and “Depression” affirmations if you wish to have less anxiety and depression. However, this type of mind training will help you go the extra mile, speeding up benefits for the already well-trained meditative mind. We suggest building a strong base with the NeuroAscent->NeuroPeak->NeuroNova->Awakened Mind programs and then supplementing with your choice of RefinedMind programs. Using the “base” programs 60%-80% of the time is what many advanced users recommend, regardless of which benefits you seek.